The new "Machine Vision Microscope" (MVM) is a purely digital microscope with all the features that make a microscope. It has an apochromatically highly corrected microscope objective and a corresponding tube lens which magnifies each object point to a pixel of the 5MP Sony IMX264 sensor. In addition, a coaxial incident light illumination as well as a diffuse ring light were installed. The module offers an unprecedented level of usability. They come with their own image acquisition software, so they can be easily integrated into any network, system or production environment. The new digital microscope can therefore be easily integrated into measuring instruments, analysis systems or bio-imaging systems. The MVM is part of the new Imaging Module family in the 90° IM•compact M design and sturdy aluminum housing, with a single connection (Plug&Play). 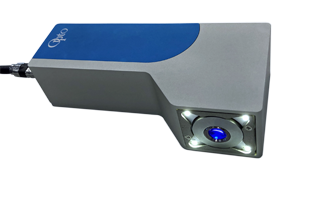 Imaging modules are optimized combinations of camera, optics, illumination and electronics for a specific application at the same or lower price than a combination of standard components. They are not only more robust and better adapted to the application, but also ensure the same configuration when re-ordered. A coaxial incident light illumination and a diffuse ringlight were installed in this module. Both lights are controlled and powered via the USB 3.1 port of the integrated camera. A specially developed control electronics allows alternating operation of the two light sources. The interaction of a highly sensitive sensor and very efficient LEDs with a powerful optical system allows this compact combination. A very intuitive measurement and labeling software is integrated for stand alone applications as well as a comprehensive camera control for demanding integration tasks. Since each module is unchangeable in magnification, it is pre-calibrated at the factory and the settings are stored in its own electronics, so that measurements can be taken immediately. Please note that the download of the 'Opto Viewer' requires prior registration or login. Registration on the website is free and gives you access to our software and detailed information about our product. The protection of your privacy during the storage and processing of your personal data is a particularly important concern for us. Your data required for registration will not be passed on to third parties; your data will only be used for our information.